"This is Ryan Murphy's (creator of "Glee") latest depraved initiative to promote his gay agenda," Dan Gainor, vice president for Business and Culture at Media Research Center, told ABC News. The Fox show on Tuesday was centered around Lady Gaga's "Born This Way" â or what Glee club leader Will Schuester called the queen of self-love's anthem to acceptance. The "assignment" this week for the New Directions students was accepting who they are â "the best and worst parts" â including their nose (Rachel), trouty mouth (Sam), slanted brown eyes (Tina), and homosexuality (Kurt, Santana, and Karofsky). They were asked to think of a word or phrase that best describes what they are ashamed of or what they would like to change about themselves "but you can't because you were born that way," as Miss Pillsbury stated. That was then printed onto white t-shirts, which the students proudly wore while singing Gaga's "Born This Way." Some of the lyrics to "Born This Way" include: I'm beautiful in my way 'cause God makes no mistakes. I'm on the right track baby, I was born this way. Don't hide yourself in regret, just love yourself and you're set. "A different lover is not a sin ... No matter gay, straight, or bi, lesbian, transgendered life, I'm on the right track baby." Calling McKinley High the "gayest high school in the history of mankind, Gainor told ABC, "This is clearly Ryan Murphy's vision of what growing up should be, not most of America's. It's a high school most parents would not want to send their kids too." 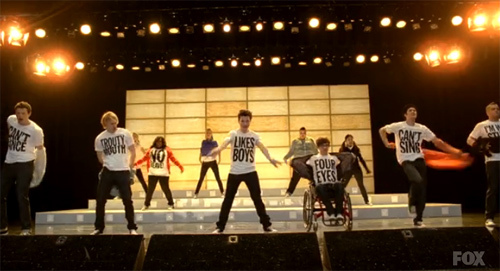 "Glee" has been called out by conservatives for its promotion of homosexuality. Last month, openly gay character Kurt shared in a kiss with fellow homosexual Blaine. This week, closeted gay characters Santana and Karofsky were being nudged to come out. Meanwhile, with Kurt back at McKinley High, he plans to start a chapter of PFLAG (Parents, Families, and Friends of Lesbians and Gays). While celebrating Gaga-style how they were "born," Christian leaders have found fault in the pop singer's song and the notion of being born a certain way. "We are not 'slaves to our biology' unless we choose to make ourselves so by believing it to be the case," said Chuck Colson, a prominent evangelical and founder of Prison Fellowship Ministries, in an earlier commentary. "[S]aying that biology is somehow normative is not the same thing as saying that is determinative. We are free to choose how we behave, both for good and for ill."
Lane Palmer of Dare 2 Share Ministries noted that the only way everyone was born was as fallen, sinful beings. Fortunately, that sinful life can be redeemed. "Lady Gaga might sing about a sinful lifestyle being the design God had for her, but I promise you He (God) has something infinitely better for her, and you, and me," he said. The "Glee" episode on Tuesday was 90 minutes long and was the second time it paid tribute to Lady Gaga.